There’s an overwhelming number of free WordPress themes available – just search Google. With so many free themes available, you may be wondering why on earth you would ever pay for a premium theme? Why should you pay for something you can get for nothing? If you are looking for best free WordPress themes, you are in the right place. Here are our favorites free WordPress themes for 2013 (may be it’s duplicated with previous post). Time to give back a bit! Do you want to write about something you love and show it in a magazine-type of way? Here is a theme for you. Inspired by the beautiful Listverse. If you want to design WordPress themes, but don’t have good enough php knowledge or foundation to build on, you are free to use this theme as base. is a fully responsive theme that features a super-clean look and feel. It is designed so that the user only has to think about content in the build process. It is customizable in terms of color, backgrounds and header and is widget-ready. (The Instagram widget is particularly nice.) This theme also has some great built-in search engine optimization tools to make getting online a breeze. Yes, it’s another free theme of Alx Media. Write about something you love and share with the world in classic tumblog style! A theme in classic personal tumblog style. Fully featured, responsive and high resolution. 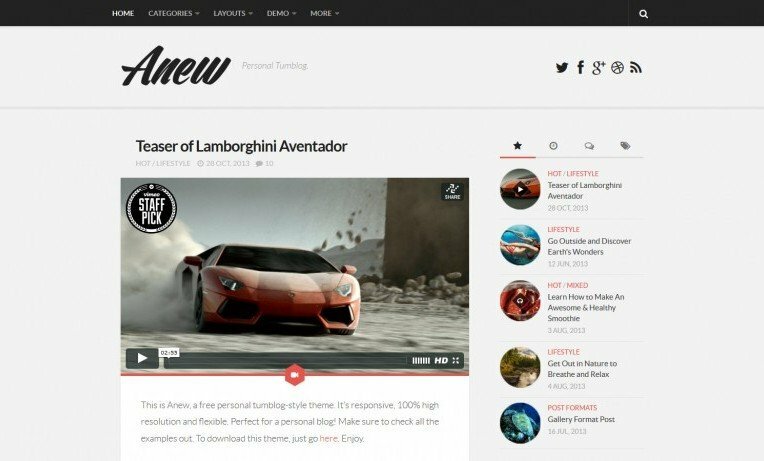 Anew gives much content variety with all 10 post formats shown in a unique way. The way sidebars are treated for phones and tablets is pretty unique. Resize your browser window’s width on the live demo to see how it works, or use CTRL+scrollwheel to zoom in and see high resolution in action! Writr is a minimalist, content-oriented tumblelog theme perfect for your personal blog. It’s made of by WordPress.com and you can use it for free of charge too. Writr is responsive — from desktop to mobile, and everything in between. The design will adapt to any screen without sacrificing usability or design integrity. 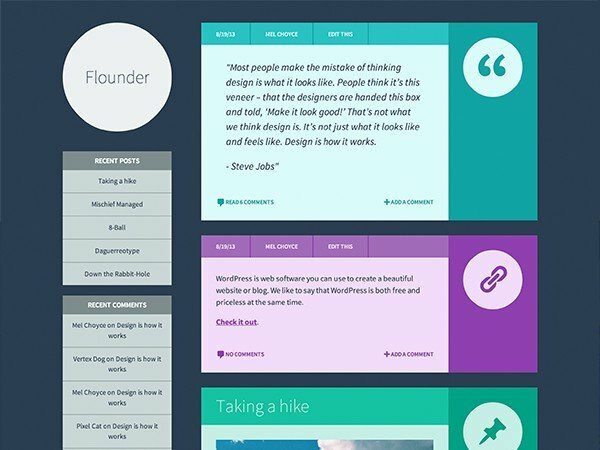 Flounder is a flat style blogging theme with support for post formats, including color and icons for each. It’s based on the Underscores theme, which is used by the Theme Team at WordPress.com. While there are not a large number of free e-commerce themes out there, Shopping does offer some basic sales functionality in a free, WooCommerce-based theme. The simple theme includes plenty of room for product images, prices, ratings and sales information. 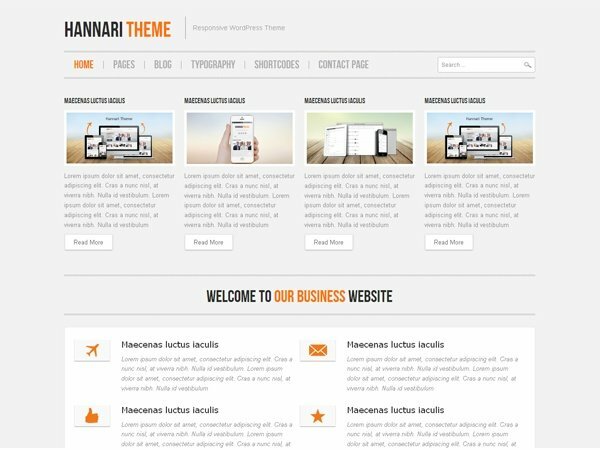 Hannari is a simple business-oriented theme with a simple design and plenty of bonuses for a free theme. The responsive theme includes tools such as a site map, SEO optimization, a contact form and email newsletter integration. Hannari also includes social media widgets and a variety of customization options so that you can use the theme without worrying that your site will look too much like someone else’s. 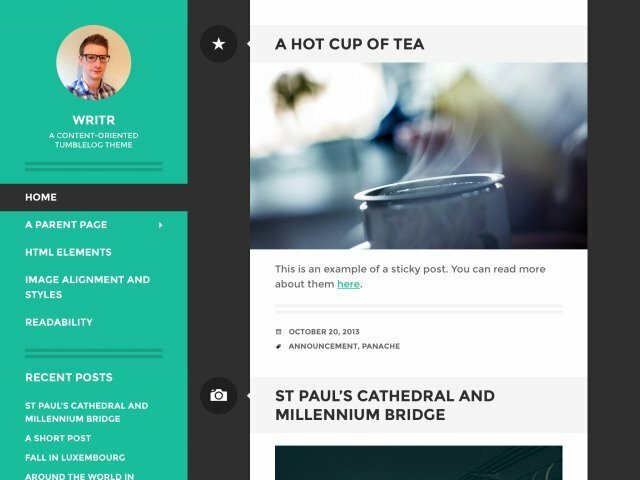 This responsive magazine-style theme includes a ton of widgets that make it easy to connect to social media. But the biggest bonus that comes with ProMax is built-in connectivity to Google AdSense and placements for common advertising sizes. The ad-ready features are easy to use and great for a blogger looking to jump into the world of blog revenue generation. ProMax includes a variety of customization options as well, from color to background and customer header and favicon. Taking a lead from news sites like the Huffington Post they’ve incorporated a big ‘ol slider on the home page. By default this slides the latest posts, but you can also use the core WP ‘sticky posts’ feature to flag those particular posts you want to feature in the slider with bold headlines and large format images. This fully responsive theme is designed for sites that have a focus on news-style content. One of the best features of The Newswire is the large slider. The theme also includes “sticky posts,” multiple navigation options and plenty of color and font customization. If you like any of these themes and use it for commercial purposes, I would suggest showing your support by sending a donation to the designer of that specific theme. Also, out of all the themes released during 2013, which one was your favorite? Tell us in the comments.